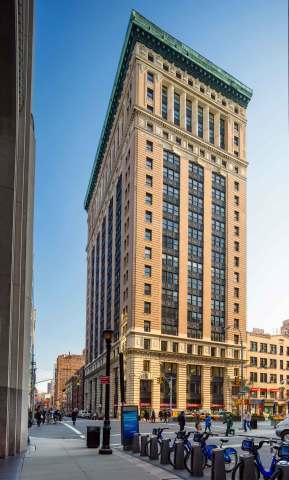 NEW YORK--(BUSINESS WIRE)-- With the recent signing of a full-floor lease, Columbia Property Trust, Inc. (NYSE: CXP) has now leased all available office space at 315 Park Avenue South, a 20-story, 331,000-square-foot office building in Manhattan’s Midtown South district, bringing the building to 99 percent leased overall. Following a full building renovation, Columbia has created an ecosystem of high-profile tech, media and investment companies at the building while achieving some of the highest rents on Park Avenue South. Just before the close of last year, independent research firm PitchBook, the premier data provider for the private and public equity markets, secured the last remaining office floor at 315 Park Avenue South, giving the firm a total of three full floors and bringing the property to 99 percent leased. Other new tenants include global investment management firm Winton Capital, digital media publisher BDG Media, digital asset exchange and custodian Gemini Trust, and digital content producer Fullscreen. 315 Park Avenue South also now boasts a full-service, 45,000-square-foot Equinox gym. When Columbia acquired the building in 2015, its major tenant at the time, Credit Suisse, was in the process of vacating in connection with a consolidation into its nearby headquarters. Since that time, Columbia has fully repositioned 315 Park Avenue South with a lobby renovation, elevator modernizations and mechanical upgrades to create a modern, boutique office designed for discerning creative tenants. A façade restoration is also underway that will wrap up by early spring. L&L Holding Company and their leasing team of David Berkey and Andrew Wiener were engaged early on and were instrumental in the redevelopment and leasing of the property. The property also includes a 3,500-square-foot retail suite at the corner of 24th Street and Park Avenue South, for which Columbia is in advanced negotiations with a prospective tenant. In February, Columbia will complete the building’s retail mix when it opens a marketing suite for 799 Broadway, a ground-up, 182,000-square-foot office development venture with Normandy Real Estate Partners, set to deliver in the summer of 2020. 315 Park Avenue South is one of seven buildings in Columbia’s Manhattan portfolio, which, in addition to the 799 Broadway development project, also includes 114 Fifth Avenue, 149 Madison Avenue, 218 West 18th Street, 229 West 43rd Street, and 249 West 17th Street. Columbia Property Trust (NYSE: CXP) creates value through owning, operating and developing Class-A office buildings in high-barrier U.S. office markets, primarily New York, San Francisco, and Washington D.C. Columbia is deeply experienced in transactions, asset management and repositioning, leasing, and property management. It employs these competencies to grow value across its high-quality, well-leased portfolio of 19 properties that contain nine million rentable square feet, as well as one property under development. Columbia has investment-grade ratings from both Moody’s and Standard & Poor’s. For more information, please visit www.columbia.reit. Certain statements contained in this press release other than historical facts may be considered forward-looking statements within the meaning of Section 27A of the Securities Act of 1933 and Section 21E of the Securities Exchange Act of 1934. We intend for all such forward-looking statements to be covered by the applicable safe harbor provisions for forward-looking statements contained in those acts. Such statements include, in particular, statements about our development projects and leasing transactions and prospects and are subject to certain risks and uncertainties, including known and unknown risks, which could cause actual results to differ materially from those projected or anticipated. Therefore, such statements are not intended to be a guarantee of our performance in future periods. Such forward-looking statements can generally be identified by our use of forward-looking terminology such as "may," "will," "expect," "intend," "anticipate," "estimate," "believe," "continue," or other similar words. Readers are cautioned not to place undue reliance on these forward-looking statements, which speak only as of the date of this press release. We make no representations or warranties (express or implied) about the accuracy of any such forward-looking statements contained in this press release, and we do not intend to publicly update or revise any forward-looking statements, whether as a result of new information, future events, or otherwise. Any such forward-looking statements are based on a number of assumptions involving judgments with respect to, among other things, future economic, competitive, and market conditions, all of which are difficult or impossible to predict accurately. To the extent that our assumptions differ from actual conditions, our ability to accurately anticipate results expressed in such forward-looking statements, including our ability to generate positive cash flow from operations, make distributions to stockholders, and maintain the value of our real estate properties, may be significantly hindered. See Item 1A in the Company's most recently filed Annual Report on Form 10-K for the year ended December 31, 2017, for a discussion of some of the risks and uncertainties that could cause actual results to differ materially from those presented in our forward-looking statements. The risk factors described in our Annual Report are not the only ones we face, but do represent those risks and uncertainties that we believe are material to us. Additional risks and uncertainties not currently known to us or that we currently deem immaterial may also harm our business.